1. Place rack in upper third of oven and preheat oven to 400Â°F. 2. In large bowl, toss together cheese and baking mix until well combined. Stir in milk. Add sausage and knead until sausage is evenly distributed. Form mixture into 1-inch balls and arrange on two ungreased baking sheets. 3. Bake for 10 to 12 minutes, or until golden brown. Serve warm. 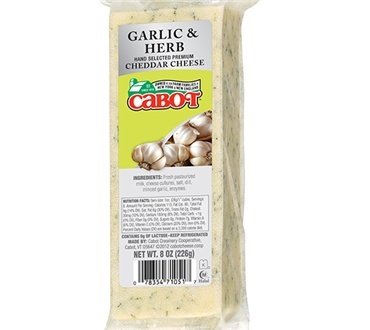 *Or use a flavored Cabot Cheddar, such as Chipotle or Garlic and Herb. One of our very favorites. I can't find it locally so I ordered enough for me and my two adult children! This cheese was sooo good! The garlic and herbs in this cheese made it one of my favorites! If you like garlic and cheese this is for you, if not stay away. Enough garlic in this cheese to kill a vampire. Yum I love it, garlic or green onion cheese with strong flavors . I found a new favorite here. This has been a family favorite for years. I love to give it as a gift.